Lake Kariba is the world's largest man-made lake and reservoir by volume. It lies 1,300 kilometres (810 mi) upstream from the Indian Ocean, along the border between Zambia and Zimbabwe. 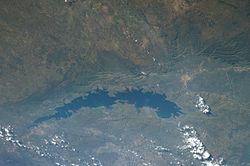 Lake Kariba was filled between 1958 and 1963 following the completion of the Kariba Dam at its northeastern end, flooding the Kariba Gorge on the Zambezi River. The Zimbabwean town of Kariba was built for construction workers on the lake's dam, while some other settlements such as Binga village and Mlibizi in Zimbabwe and Siavonga and Sinazongwe in Zambia have grown up to house people displaced by the rising waters. Lake Kariba is over 223 kilometres (139 miles) long and up to 40 kilometres (25 miles) in width. It covers an area of 5,580 square kilometres (6.01×1010 square feet)mi) and its storage capacity is 185 cubic kilometres (44 cubic miles). The mean depth of the lake is 29 metres (95 feet); the maximum depth is 97 metres (318 feet). It is the world's largest man-made reservoir by volume, four times as large as the Three Gorges Dam. The enormous mass of water (approximately 180,000,000,000,000 kilograms, or 180 petagrams [200 billion tons]) is believed to have caused induced seismicity in the seismically active region, including over 20 earthquakes of greater than 5 magnitude on the Richter scale. The lake has several islands, including Maaze Island, Mashape Island, Chete Island, Sekula, Sampa Karuma, Fothergill, Spurwing, Snake Island, Antelope Island, Bed Island, and Chikanka. Before Lake Kariba was filled, the existing vegetation was burned, creating a thick layer of fertile soil on land that would become the lake bed. As a result, the ecology of Lake Kariba is vibrant. A number of fish species have been introduced to the lake, notably the sardine-like kapenta (transported from Lake Tanganyika), which now supports a thriving commercial fishery. Other inhabitants of Lake Kariba include Nile crocodiles and hippopotami. Gamefish, particularly tigerfish, which was among the indigenous species of the Zambezi river system, now thrive on the kapenta, which in turn encourages tourism. Both Zambia and Zimbabwe are now attempting to develop the tourism industry along their respective coasts of Lake Kariba. Fish eagles, cormorants and other water birds patrol the shorelines, as do large numbers of elephants and other big game species including Lion, Cheetah, Leopard, Buffalo and a myriad of smaller plains game species. The southern Matusadona National Park was once a haven for Black and White Rhinoceros, but recent poaching activity has dramatically reduced their numbers. The portion of Lake Kariba which falls within Zimbabwe has been designated a Recreational Park within the Zimbabwe Parks and Wildlife Estate. ^ "Kariba". Encyclopædia Britannica. Retrieved 2007-07-31. ^ Scholz, C. H.; Koczynski, T. A.; Hutchins, D. G. (1 January 1976). "Evidence for Incipient Rifting in Southern Africa" (PDF). Geophysical Journal International. 44 (1): 135–144. doi:10.1111/j.1365-246X.1976.tb00278.x. "Lake Kariba". Zambiatourism.com. Retrieved August 11, 2005. "Dam Statistics: Africa and the Middle East Regions". World Commission on Dams. Retrieved August 11, 2005. "Lake Profile: Kariba". LakeNet. Retrieved August 11, 2005.